The Rif Mountains are famous for their cannabis cultivation. We are going to avoid the worst area even though it is the most scenic. Our tour book, the local GoldWing Club and the travelers on Horizon's Unlimited all say it is a lot of hassle to travel through that route. So we head to Fes at the base of the mountains by the less scenic route. Fez is the oldest of the "Imperial Cities". It dates from before the time of the Moslem religion. It has been the capital city of several sultans and kings. And it has an equally ancient Medina (old town inside the wall). You can see one of the towers of the wall in the bottom center of the picture. You can also see the fertileness of the area in the wheat fields and olive groves that stretch to the horizon. 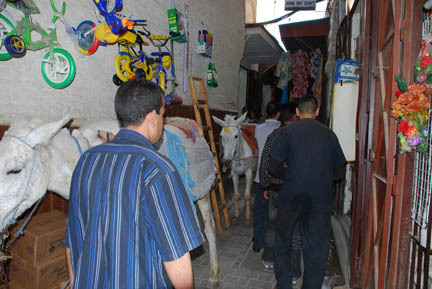 In the Medina is the "souk" (shopping area of small stalls). 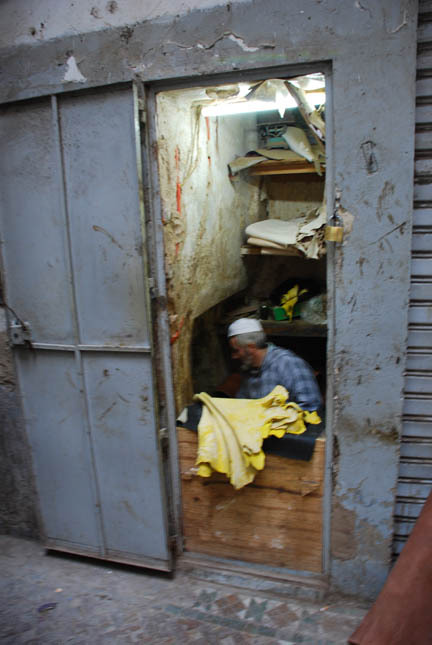 The souk is made of lots and lots of little lanes that intersect and divide at random and lined with shops. We hired a guide again. We'd still be lost in there without one! The only way that these businesses can get stock is to hand carry it, or use mules or donkeys to carry it. You need to be alert for the cry (in Arabic) of "Watch out" or you'll get run over! This man had the smallest business of anyone. He does leatherwork. His shop is the size of a phone booth! It has an extension about 2 feet high into the wall in front of him for storage. This is his entire shop! We also went to a pottery factory (and bought some). 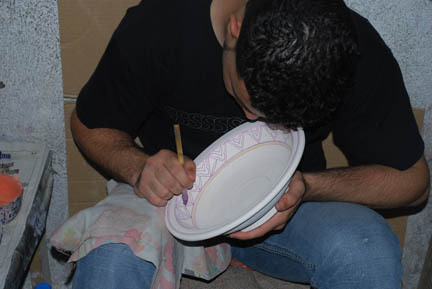 The work is done by hand but comes out with the precision of a computer. It must take many years of practice to achieve this level of accuracy in the pattern. Then on north through fertile fields to Volubilis, the ancient Roman capital of this area. 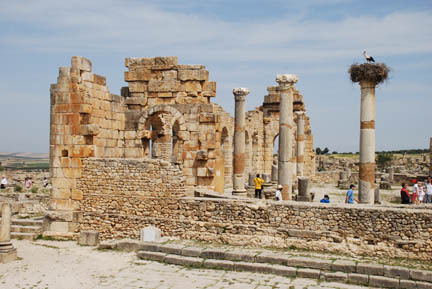 Volubilis was occupied during the first, second and third centuries. 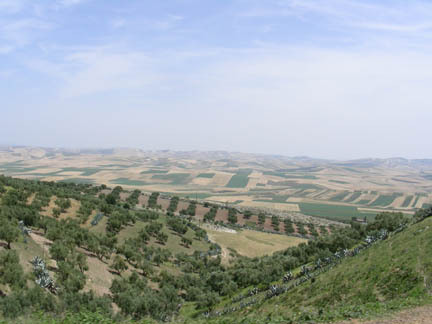 It overlooks a fertile valley and controlled the western part of Roman Africa. Unlike the European Roman ruins, it does not look like it has been heavily scavenged for building materials by successive generations. All of the buildings are in ruins, but there is a huge amount of squared stone and pieces of columns lying around the site. This is the forum, complete with a stork nest on the pillar. We noticed that smaller birds (wren sized) use the interior of the sides of the stork's nest as a place to build their nests. 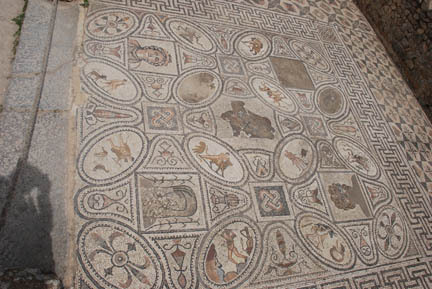 Volubilis is famous for the over a dozen fine mosaic floors still in place. 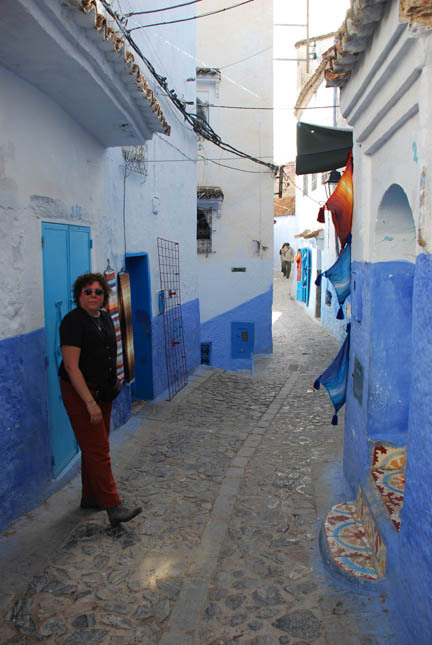 Then on to Chechaoun, a mountain village famous for its blue lanes. Although the Chechaoun Medina is famous for the blue color it is a rather recent addition to the ancient village. The Jewish community started doing it in the 1930's and it caught on with the rest of the village. 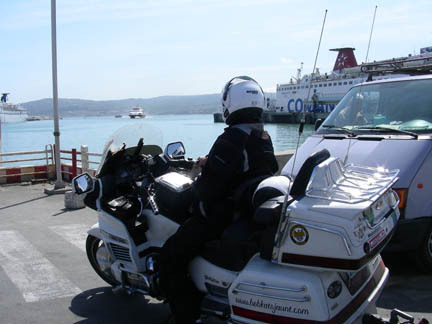 Upon arrival in Spain we declared that we had no cigarettes or liquor and cleared customs without an inspection. (It's true, we had no cigarettes and our liquor was left over from Portugal, not the duty-free store on the ship.) 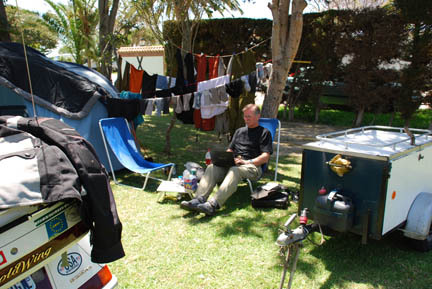 We went back to the nice campground we had used before leaving Spain and proceeded to wash two weeks of Sahara dirt out of our clothes, gear and bike. I also updated these pages as there is WI-FI right at our campsite. From here we head east along the coast of Spain and north towards Andorra. Then on through France to the Loire Valley and Paris.